Fanplayr, the leader in digital coupons and offers, today announces a Bronze Partnership with Magento, a leading eCommerce platform provider with more than 110,000 merchants worldwide and a part of X.commerce, an eBay Inc. company. This joint venture gives Magento Enterprise merchants access to Fanplayr’s premium offerings including “Smart & Targeted” Coupons & Offers and digital rewards in order to better reach, influence and monetize the social consumer across email, web, mobile and social marketing. The Magento platform, an open-source platform that offers merchants complete flexibility and control over the presentation, content and functionality of their online store, is built to allow for easy integration of desired solutions like Fanplayr. Implementing Fanplayr will allow online retailers to easily set up fun social coupons and offer marketing games and promote them across their Facebook and Twitter pages, website and eCommerce product pages, email and Facebook ads. Fanplayr is the first company to apply social and mobile game mechanics to the multi-billion-dollar coupon and offers marketing industry, making it easy for brands and Internet retailers to extend Facebook’s social fabric and game mechanics across important marketing platforms such as email newsletters, web pages and microsites, ecommerce product pages, mobile pages, Facebook pages, and digital ads. Just 100 days since launch, Fanplayr has already signed more than 500 merchant clients for whom they have increased user engagement 31 times, driving click-throughs from the average of 0.14 percent up to 4.4 percent. Fanplayr is the coupon and offers platform designed to help marketers reach, influence and monetize the new social consumer across web pages, e-commerce pages, email newsletters, digital ads, mobile, Twitter and Facebook Pages. Using Fanplayr’s self-service campaign wizard, marketers can set up a Fanplayr coupon game campaign in less than 20 minutes with no IT required. Fanplayr is the first company to apply social and mobile game mechanics to the multi-billion-dollar coupon and offers industry. Fanplayr is a privately held company with headquarters in Palo Alto, California. 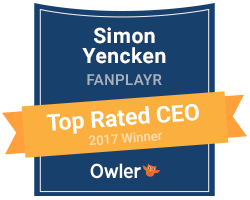 More information is available at http://www.fanplayr.com.